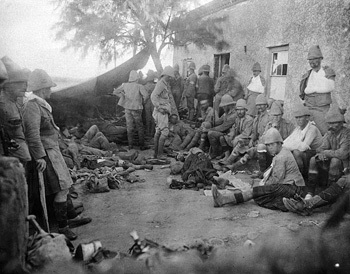 Field Hospital, Paardeberg, 19 February 1900, the second day of the battle. Most of the soldiers are British Gordon Highlanders, but some are from 2 RCRI. Over four thousand men, or nearly ten percent of the Boer army, surrendered. It was the first significant British victory of the war. The Royal Canadians received much of the credit. The victory provided a boost to the morale and confidence of the troops and to Canadian nationalism.